Fixing America: Breaking the Stranglehold of Corporate Rule, Big Media, and the Religious Right. By John Buchanan. Buchanan offers simple solutions that common citizens can support in common cause, based on common sense. Drawing on historic voices that include Thomas Jefferson, John Adams, Thomas Paine, James Madison, Mahatma Gandhi, Mark Twain, and Robert F. Kennedy, the author articulates a fresh vision for 21st. 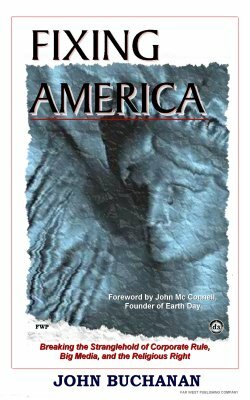 century America that deserves the attention of every patriot left in these trying times. "John Buchanan writes with the white heat of a prophet. He has connected the dots and articulated a great warning to this nation: fascism is upon us and democracy is in grave danger. I hope this book is read by Christians, as it clearly also warns that the Church has been co-opted by a theology straight out of Hell." -- Reverend Rich Lang, Trinity United Methodist Church, Seattle, Washington. 263 pgs. 5x8. Pbk. ISBN: 0-89540-436-2.